Balfour was Chief Secretary for Ireland between 1887-1891 (while his uncle Lord Salisbury was British Prime Minister) and was captain of the Royal and Ancient Golf Club between 1894-1895. Arthur’s brother Gerard took over the position of Chief Secretary for Ireland between 1895-1900 and both were avid golfers at this stage. They were a couple of Right Honourables and 1st and 2nd Earls of Balfour and also served as conservative politicians with Arthur serving as Prime Minister between 1902-1905 which dovetails nicely with the Earl of Dudley’s, a fellow golfer, appointment as Lord Lieutenant of Ireland. It’s not on first sight very obvious how the appointment of a statesman to the Chief Secretaryship for Ireland can have an intimate bearing on the history of the game of golf. Nevertheless that appointment, in the year 1886, of Mr. Arthur Balfour had, in my humble judgment, an important influence and bearing on the game. It so happened that about this time an eminent weekly journal had propounded the statement that none but stupid people played golf, and even that the successful playing of golf demanded, as an essential condition, that the player should be stupid and destitute of all imagination and of all intellectual interests. It was rather an extravagant statement.At the same time also the office of the Irish Secretary was invested with a peculiar importance in the public eye. It was not long after the tragic affair in the Phoenix Park. Ireland was seething with murderous discontent.The man who accepted the secretaryship took his life in his hand with that acceptance, and this risk Mr. Balfour took with all his characteristic coolness and courage. 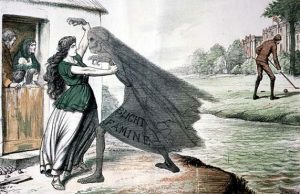 The tragic affair Hutchinson was referring to was the Phoenix Park Murders where Lord Frederick Cavendish, the recently appointed Chief-Secretary for Ireland, and Thomas Henry Burke were fatally stabbed in the Park and triggering a huge murder investigation which resulted in four Fenians being hanged. It is understood he had only taken up the game the year prior to taking up his position in Ireland but was a member of the North Berwick Golf Club. Coincidentally the Royal Dublin Golf Club’s beginnings were in the Phoenix Park (1885) and with the course so convenient to the Chief Secretary’s Lodge (currently the official residence of the United States Ambassador to Ireland, “Deerfield House”) he naturally joined the club, the club eventually moved to the North Bull Island in 1889. The troubles continued after the Phoenix Park Murders and by the time Balfour took up office his action to quell revolts and subversion against the Crown with the Cirmes Act were dealt with swiftly and impartially despite earning the title ‘Bloody Balfour’ following his backing of three policemen who were found guilty of wilfully killing three tenants in Michelstown. Belfast – click here to read article.